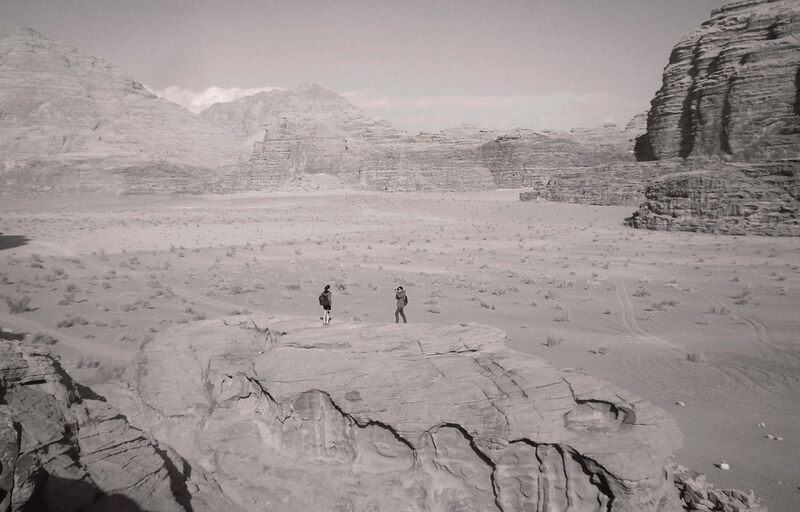 "People of Wadi Rum are kind and welcoming, and their hands and faces are patterned by the years of sun and sand," writes Ivana Perić in her intimate meeting with the Jordanian landscape. With sand and rocks stretching over 700 square kilometers, Wadi Rum – The Valley of the Moon – is the largest wadi (valley) in Jordan. I went there right after landing in Aqaba, Jordan’s only coastal town. My plane touched down around dawn, the strong morning sunlight was still an hour or two away, but the heat and humidity had already arrived. The taxi driver, Muhammed, talked about all the people he met driving around Jordan, as the lights of Aqaba moved around us. The air was coming in through the opened window and I enjoyed the sights and smells of a town waking up. We stopped to drink black tea at a small coffee stand decorated with colorful light bulbs. It was 5am, and Muhammed announced we should be in Wadi Rum in little more than an hour. When we arrived, it was almost magical. The sun was looking for its place high up in the sky, the air was fresh, almost chilly. Huge rocks covered the horizon, enclosing the long meadows of sand. The sand color switched from brown and redish to purple and vibrant orange. During my days spent in Wadi Rum, I came to some conclusions. First of all – breathing is easier out there. There is something particularly powerful about the desert scenery, it extends your horizon endlessly, and cleans your soul like a strong wind, deprives it of everything that’s not important. Second – one can feel so tiny and so big at the same time. It’s the spell of endless spaces, the spell of nature’s wonders. It’s all about those moments when you are so tiny comparing with the great nature around you, and yet, you feel so big and honored just by being a part of something so magnificent. Third – sometimes the moon is all you need. In Wadi Rum, stars can come so close to the ground, it seems they are going to break on it. Moon is the king, high above, and sunsets are mild and welcoming, as if the sun can’t wait to see the stars and the beauty of a night sky too. Fourth – there’s always a way to grow and survive. Between the harsh rocks, nurtured by nothing but the sand and dry sun, a tree can blossom. Lastly – you grow old in the desert early, but you’re never too old for a smile. People of Wadi Rum are kind and welcoming, and their hands and faces are patterned by the years of sun and sand. Many of them, as most of the others I met on my journey throughout Jordan, are refugees. They don’t define themselves as Jordanians although they might have lived in Jordan for a long time. They are Palestinians, Syrians, Saudis, and they always speak of their homeland with bricks in their throats. There was a lot of silence while I took my last photos and continued my journey to a more popular tourism spot, Petra, knowing that my mind will stay roaming around Wadi Rum a little longer.